Lake Tahoe California is renowned for the numerous world-class ski resorts like Squaw, Heavenly, Northstar and Alpine Meadows, just to name a few. With its lofty mountains, consistent weather and huge annual snowfall totals, Lake Tahoe is consistently ranked as one of the best ski and snowboarding destinations in the world. If you’re considering taking a ski/snowboarding trip this year, you should forget about Colorado and Utah. Lake Tahoe has sunnier skies, milder daytime temperatures and more things to do when you’re not on the slopes. Here is a beginner’s guide to hitting the slopes at Lake Tahoe California. Some of the largest ski resorts in the United States are located in Lake Tahoe. If you’re a first-time skier or snowboarder, Lake Tahoe probably seems intimidating. In reality, the massive size of the resorts in Lake Tahoe will work in your favor when you’re learning to ski. With 4,800 skiable acres, Heavenly is the 5th largest ski resort in North America. Squaw ranks only a few places lower in 9th place with 3,600 acres. Both resorts have dozens of trails for beginners, which is a whole lot more than you would find at smaller resorts. Heavenly actually has two separate “learn to ski” areas with surface lifts and magic carpets. More beginner trails means less crowds on the slopes and shorter lines at the lifts so you can squeeze in more runs. Nearly all of the resorts in Lake Tahoe offer package deals which include rental equipment, lessons and a lift ticket. For beginners, I highly recommend taking a lesson the first time you hit the slopes. One of the biggest mistakes that new skiers and snowboarders make is trying to wing it. 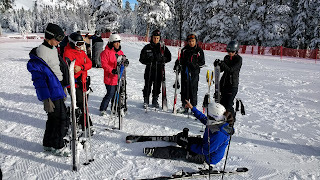 Whether you opt for a private tutor or a group lesson, you’ll learn how to use the lifts, how to use your equipment, how to get up after a fall, how to understand the signage on the trails, and proper techniques for getting down the slopes safely. Many resorts also offer full day "camp style" lessons for kids. California has made a major push in recent years to emphasize safety at the resorts. Lake Tahoe is arguably one of the safest and most family-friendly places to learn to ski in the world. 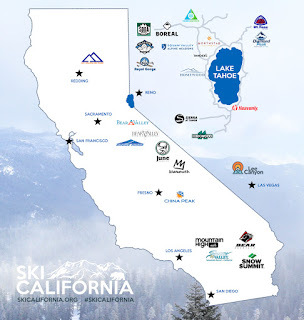 January is National Ski Safety Awareness Month and Ski California has developed a new guide, dubbed Safety Mountain, to emphasize the importance of safety in snow sports. January is also Learn to Ski and Snowboard Month, and Ski California is encouraging safe and professional ski lessons throughout January. Safety month kicked off with the World's Largest Ski Lesson on Jan 6. 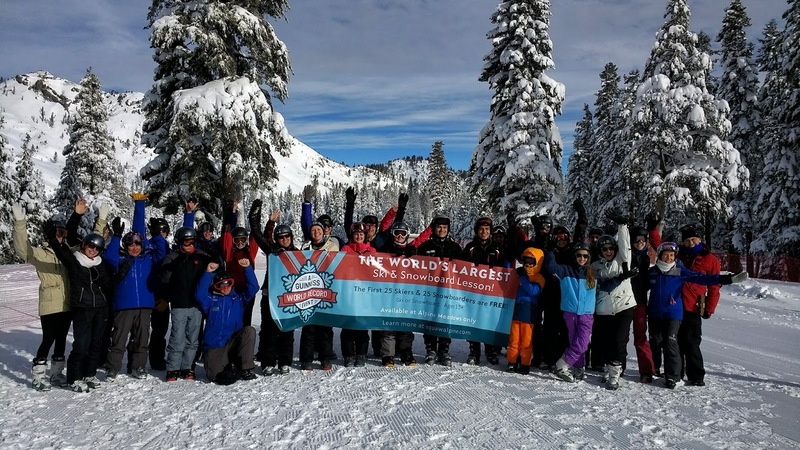 Joined by over 80 ski resorts from across North America and Canada, the World’s Largest Ski Lesson achieved a new Guinness world record by simultaneously coordinating lessons for beginners in seven different time zones. And since we're talking about safety, don’t be ashamed to rent a helmet. There really is no better piece of equipment to help prevent a serious injury on the slopes than a helmet. Helmets aren’t mandatory gear in Lake Tahoe, but I strongly recommend renting one regardless of your age or experience. Where Should I Stay in Lake Tahoe? It’s not an exaggeration to say that Lake Tahoe has some of the most beautiful resorts in California. The vast majority of people who visit Lake Tahoe stay in the southern part of the lake near the California/Nevada border. 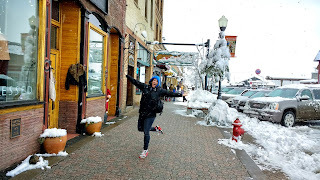 Personally, I prefer to stay up north in the town of Truckee. 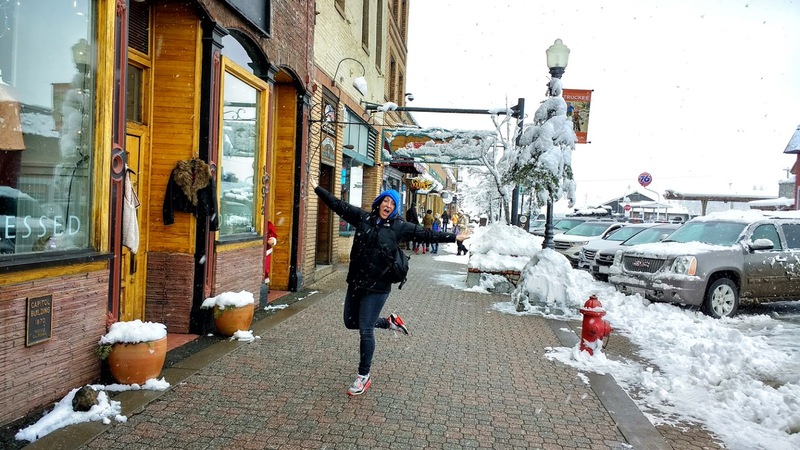 Truckee is the quintessential American ski town where you can find locally-owned shops, intimate restaurants, and ‘bed and breakfast’ style hotels. If you're looking for the perfect place to stay, my favorite resort in the Lake Tahoe vacinity is the Cedar House Sport Hotel which is located about a mile from downtown Truckee. This chic, eco-friendly hotel easily ranks among the best hotels I’ve ever stayed in. It has all the amenities of a swanky resort, while still maintaining an intimate feel. The Cedar House is also a much shorter drive for travelers who want to ski or snowboard at Squaw, Northstar and the Alpine Meadows resorts. One factor to consider is that hotel rooms in Truckee are limited and can fill up fast during peak ski times. I highly recommend booking your room several weeks in advance. Don’t try to book a room at the Cedar House last minute. Families may prefer to stay in South Lake Tahoe because there are more activities for children including arcades, an outdoor ice-skating rink, movie theaters, shopping, numerous restaurants, sleigh rides, heated outdoor pools and sledding hills. South Lake Tahoe also has several large casinos in the heart of downtown, so you’re more likely to find a cheaper room if you’re on a budget or trying to book last minute. Lake Tahoe receives an average snowfall of over 400 inches. The snow can pose challenges for getting there in the winter. Whether you fly into Sacramento or Reno, you're going to have to drive up some mountain roads to reach the resorts. There are two major highways you can take from points west in California, route 50 to the south and I-80 to the north. These highways are extremely well-maintained by road crews and only close during the worst blizzards. When snow is present on the roadway, chains are often required and traffic may be restricted to 4-wheel drive vehicles only. 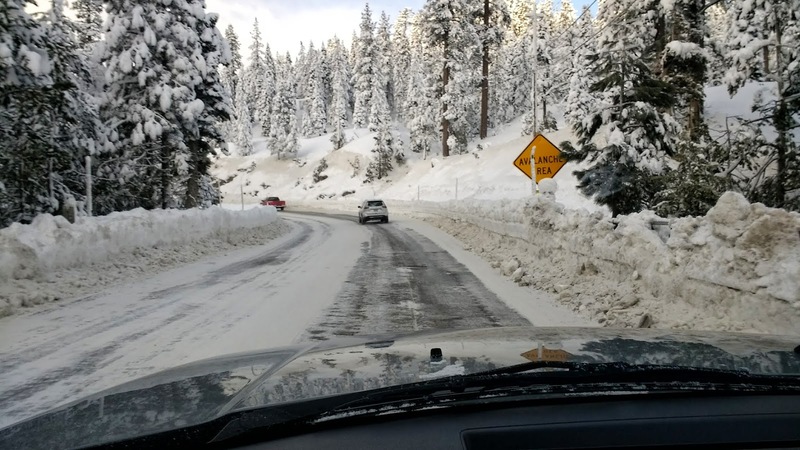 You should always check for road closures and inclement weather before you head up to Lake Tahoe. A good way to avoid getting stranded is to rent a 4-wheel drive vehicle before you head up the mountain to Lake Tahoe. The Sacramento Airport is likely the cheapest and easiest option for renting a 4-wheel drive vehicle if you’re headed to Lake Tahoe from Southern California. You can regularly find rental deals on Travelocity and Orbitz for around $150/week. Just park your car in the satellite parking lot at the Sacramento airport and then pick up your rental car from the terminal. Many people who live in Southern California take for granted just how harsh the weather can be in the Sierra Nevada mountains. Lake Tahoe has an average low temperature that is below freezing from November through April. You don't want to get caught in a storm in Lake Tahoe without proper gear. If you're driving, it's extremely important to keep blankets and water in your car in case of road closures or sudden inclement weather. Chances are, you won't run into problems on the road, but it never hurts to be prepared. Just because you’re on a ski trip, it doesn’t mean you can’t fit in some hiking. I recommend checking out the 3 waterfalls located in the southern part of the lake just off route 50. These hikes are open year-round, but are sometimes inaccessible in the winter due to the snow. While not necessarily required, a good set of snowshoes is probably good idea if you intend to do any hiking in Lake Tahoe in the winter.